I ran across Jacqueline's blog a few weeks ago and fell in love with all of the beautiful, inspiring pictures. Every one sent tons of ideas racing through my mind. I couldn't stop looking at them all--each was better than the last. But there was one in particular that stuck out, and I haven't been able to get it out of my head since. Aren't those vintage baskets just gorgeous? And that red T? Love! I knew I had to monogram a few baskets of my own. This basket I use as a drawer for linens in my dining room would be perfect. And so would this one I have on the bathroom floor for storing extra toilet paper. I printed a letter M (for my maiden name) and a No. 5 (because I like it) in plain old Microsoft Word. The M is "Glouster MT Extra Condensed" 550, and the No. 5 is "Poor Richard" 235, in case you care. I cut them carefully with an Exacto knife. Then I realized using a straight edge would make the M and N go faster. Good luck making an 8 or S.
Make sure to save the insides of any letters or numbers and tape them in place. Then I centered and taped them to the baskets. I wanted a vintage, worn look to the paint, so I mixed a little of this a little of that of my craft paint. I think it was mainly Colonial Blue, Black and Taupe. I like the way it turned out--kinda of a worn, blue-ish gray. After I painted around the stencils, I peeled the paper back and touched up my painting with a tiny artist's brush. And here they are. They turned out just like I hoped! Painting on wicker was not the easiest, but I don't mind the imperfections. After they dried completely, I lightly sanded the baskets on the painted areas and all over for just a leetle more of a vintage-y feel. Love it!! Such a great idea! 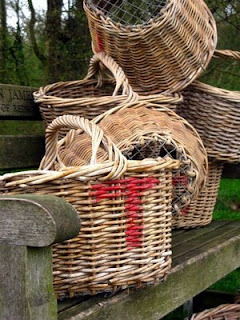 I have more baskets around here than I know what to do with - this will be the perfect way to make them a little more special! Thanks for sharing this idea - your baskets look perfect! I love this! Such a great idea for all of those baskets that everyone seems to have sitting around. Cute baskets. Love the DIY for the stencils. I've been wanting to make my own. Thanks for sharing! ooooh I like it! I love putting numbers on things and baskets opens up a whole new world of possibilities. Great job! Love the baskets. Such a cute idea! i love the no. 5! That is one neat idea! Your linen basket in that shelf is absolutely adorable! Looks like something quaint from grandma's house. I've been wanting to do this and have been looking for just the right basket to try it on. Yours look fabulous! Love them! Great job on your tutorial! This is a great idea. And you're brilliant to sand a little after you painted. I'm going to remember that tip! Very cute! Thanks for sharing a great idea! What a cute idea, thanks for sharing. How fun - I know just the baskets I want to do this to! I'll try this week! Your baskets turned out so pretty. I just painted numbers on a bench and I'm in love, great idea! I'm thinking of numbers on my dining room chairs....but now, I think I'll go paint a few baskets first! LOVE!!! The No. 5 is my favorite!!!! I may have to try this! I made my own expensive looking typography basket too~come see. Love stenciling and I love this project! Great job! WOW! You did a greay job on those baskets. They are just adoable! Love, love, love this idea! I have a stupid question though: While I thought I was pretty handy with all Microsoft applications, I am wondering what you do to print a huge single letter. I have needed large letters for monogram appliques I sew onto kids' clothes, and I've always just printed the largest letter (usually a 72 in MS Word) and then enlarged it with a copier. One step would be way easier! Lala...you can go as big as you want with the fonts in Word-no copier needed! All you need to do is go to the top of the screen where the font size box is (I think it's called the toolbar-I'm a computer dummy sometimes) and click on it so your cursor is in the box. Delete the 72 (or whatever current size font you have) and type in the size you want. That's all! Great job! These look amazing, I am putting this idea on my list!! This is my first visit to your blog and did I luck out! I am working on a storage cabinet and I have some baskets that need a little "face paint". Thanks too for telling me a way to get a larger font without a copier. I am now a follower! OK. I'm back again. I tried to enlarge it like you suggested and it automatically goes back to 72. Any suggestions? I don't have that Poor Richard 235 font either. I wondered if you have a Word application that my computer does not have. Charla...did you hit enter afterward you changed the font size? That's what I did and it stayed. My MS Word program is the 2007 version. Maybe older or newer versions don't have that Poor Richard font? And I'm sure you know this, but 235 is the size I used, it's not part of the font name...just in case that was throwing you off.